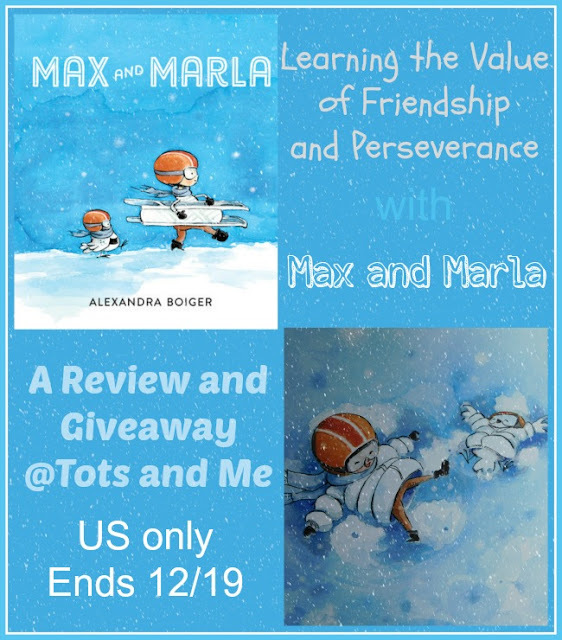 I had the pleasure of reviewing a delightful new children's book by Alexandra Boiger titled Max and Marla. This book is Ms. Boiger's debut story where she is both author and illustrator. Prior to this her life-long dream of becoming a children's book illustrator had been realized and she had become known for her work with the Tallulah series (which I was not familiar with, but after researching these books, I have decided that the children will love them as well, so I am going to have to see if our library has them). True Olympians never give up. Obstacles are turned into victories. They persevere through technical difficulties, strong winds, and sickness. They take life in stride and don't complain when these problems arise. This went perfectly with our recent unit in our homeschool curriculum. We were learning to persevere. Our words to remember were, "I don't quit, I persevere." Max and his pet owl Marla were a great example of how to do just that. They didn't quit. They kept going through the difficulties, and learned the value of perseverance and friendship. Not only was the story great, but the soft watercolor illustrations were just so sweet. Max and Marla stand out in their orange gear as they head out into the blue and white, winter wonderland. Max and Marla is a sweet book for young children that I highly recommend. It will go well with units on friendship or perseverance. Of course, winter is almost upon us, so this story would also go well with any units on snow or winter, or even the Winter Olympics. Children could have fun painting with watercolors as well. Max and Marla is recommended for ages 3-5; however, all of my children enjoyed this book, and they range in age from 3 to 8. This 32 page, hardcover book can be purchased for $17.99 (at the time of this posting) from the publisher, G.P. Putnam's Sons (an imprint of Penguin Young Readers Group). You can find Alexandra Boiger at her website and on Facebook. You can also check out the book trailer. Now for some great news. I have been given the opportunity to offer a giveaway for 1 lucky person to win a copy of Max and Marla. All you need to do is enter in the Rafflecopter form below. There are only 2 simple mandatory entries, with the remainder of the entries being optional. Remember, you do not have to do the extra entries, but they will increase your odds of winning. The giveaway runs December 6th through December 19th 2015. By entering the giveaway, you understand and agree that your contact information will be shared with the sponsor. Disclosure: I received a hardcover copy of Max and Marla in exchange for my honest review. No further compensation was given. This did not in any way influence my review. I only recommend products I use personally and feel will be a good products for my readers. My kids are grown but my grandaughter hasn't seen snow yet. Perseverance is hard so we just continue to encourage and talk through discouragement. We look for the bigger picture and keep drawing those "castles in the sky" about what we are working towards. As far as the snow, the girls love a good snowball fight! They love sledding and making snow angels. We just moved to the north so my kids had never seen snow before this winter. We had our first snow a few weeks ago and they loved building snow forts and a snowman. They love to build snowmen! My daughter loves to make snow angels in the snow! My nieces love snowball fights and building snowmen. Thanks for the giveaway! My kids like to go sledding, except we have so snow this year! My kids like to build snowmen in the snow. This year for christmas, we got our grand daughter her first sled! I don't know who is more excited me or her! My children are grown and I feel I taught them to perseverea by setting goals they could attain with effort and encouraging them. Three of the 5 are accomplished pianists and all 5 are successes in life. Snow: they enjoy the little we had in NC and we didn't have boots. I used breadbags to cover their little feet. My nieces and nephews are all still young, so they most enjoy making snow angels and tiny snowmen. In a few years they'll be old enough for serious sledding and major snow-fort building. They enjoy sledding and snow angel and snow men. We learn to persevere by other people's examples, by hearing encouraging words, and by reading or listening to book examples like The Little Engine That Could. We dont have snow!!!! FLORIDA! i would like to win this for my sister's baby shower. thanks! They enjoy sledding/sliding down the snowpiles that my husband & father in law make. My son loves sledding, but my daughter isn't much into snow activities. Although our whole family likes making snow angels! My daughter is an adult now and we live in Florida, so no snow.